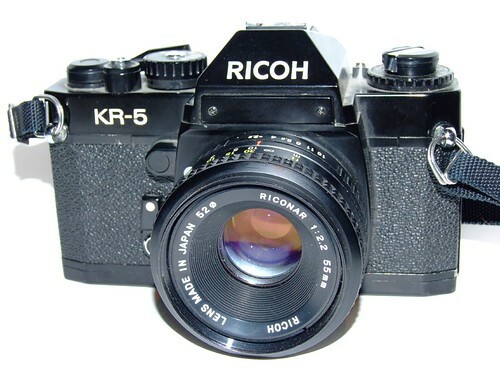 The KR-5 is one of a series of SLRs for 35mm film made by Ricoh, all accepting K-mount lenses. (Later models include the KR-5 Super, KR-5 Super II, etc.) 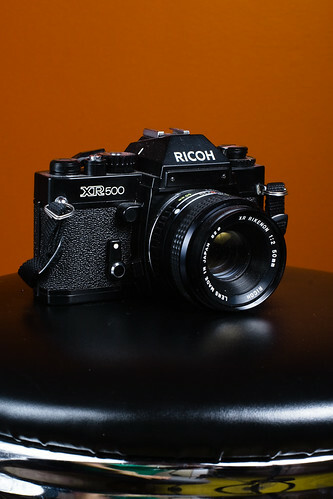 The original KR-5 was introduced in 1978, and in some markets it is designated the Ricoh XR500. The original KR-5 is the first in the series, from about 1979, and is the most limited. Its standard lens only offers a speed of f/2.2, and its range of shutter speeds is 1/8–1/500th sec. plus B, with flash sync at 1/60th sec. or lower. Two 1.5v silver-oxide batteries are needed to power the light metering circuit, which has a match-needle indicator in the viewfinder. The wind lever must be pulled away from the body to switch on the meter and unlock the shutter release. The ground glass screen is provided with a diagonal split-image spot surrounded by a microprism. The KR-5 has a hot shoe but no PC terminal. This page was last edited on 12 October 2017, at 05:16.